Victorians got a couple of substantial doses of sun in November, and more is to come. As much as we look forward to summer – warmer weather, holidays, lightweight clothes, the beach – it’s important to remember the health risks of excessive sun exposure and to do our best to avoid them. 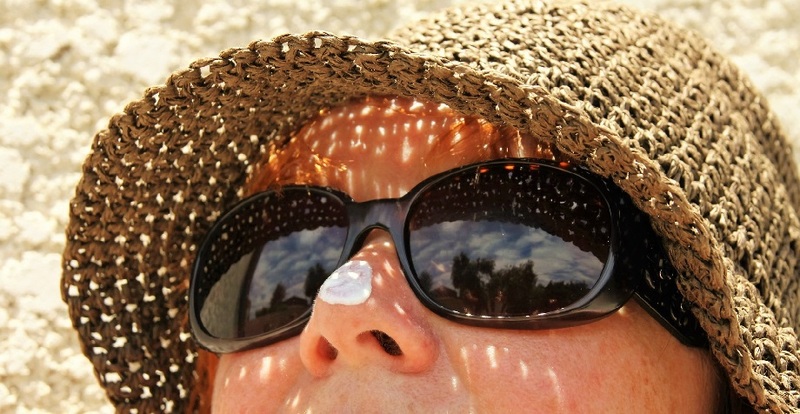 Lots of sunny days, outdoor lifestyles and (for many of us) skin better suited to northern hemisphere climates gives Australians the second-highest incidence rate of melanoma in the world. In this article, we look at the facts about sun exposure and the damage it can cause to human skin – skin cancer in particular. Sun exposure is not all bad! It’s important to remember that some exposure to the sun is beneficial. Small amounts of ultraviolet (UV) radiation are needed to produce vitamin D, which keeps bones and muscles strong and healthy. Incidence of a type of depression called seasonal affective disorder is far lower in people who live in temperate or tropical latitudes and therefore receive more sunlight during winter than those living far north or far south of the equator. Moreover, there is increasing evidence that regular exposure to sunlight contributes to the prevention of common cancers, multiple sclerosis, hypertension and diabetes. Exposure to UV radiation is the cause of most skin cancers in Australia. Skin can burn after a mere 15 minutes of exposure to the summer sun. Interestingly, in 2009 the World Health Organization classiﬁed the entire UV spectrum as carcinogenic to humans, placing it in the same category as asbestos and tobacco. UV radiation degrades the DNA in our skin cells; failure to repair this damage can prompt cells to mutate, leading to skin cancers. Although visible sunburn causes 95 per cent of melanomas, even mild but regular exposure to UV radiation can eventually lead to skin cancer. In Australia, one in eight adults and one in five teenagers are sunburnt on an average summer weekend. Sunburn is also common on cool or overcast days, as many people believe UV radiation is not as strong when the sun is obscured and therefore don’t take the usual precautions. Skin cancer can be broadly categorised as melanoma, the most dangerous form of skin cancer, and non-melanoma skin cancer (NMSC). In addition, pre-cancerous lesions such as actinic keratosis can develop into NMSC. Melanoma can grow very quickly if left untreated, and spread to the lymphatic system or bloodstream and then to other parts of the body, including the lungs, liver, brain and bones. Melanoma is the fourth most common cancer in Australians, after breast, colorectal (bowel) and prostate cancers. About two in three Australians will be diagnosed with skin cancer by the age of 70, and more than 750 000 people are treated for NMSCs in Australia each year. In 2013, 12 744 Australians were diagnosed with melanoma; an estimated 13 941 new cases of melanoma skin cancer will be diagnosed in Australia in 2017. Non-melanoma skin cancer includes basal cell carcinoma (BCC) and squamous cell carcinoma (SCC). Up to 90 per cent of NMSC can be attributed to excessive exposure to UV radiation. The incidence of NMSC in men is almost twice that in women. a scaly, dry, shiny and pale or bright pink area. a spot or lump that is tender to the touch. An actinic keratosis, also known as a solar keratosis or sunspot, is a pre-cancerous lesion that develops on a sun-exposed area of skin. It most often appears as a rough, dry and scaly patch, and is most common in older people with fair skin, pale-coloured eyes, and red or blonde hair who burn easily. The main cause of actinic keratosis is exposure of the skin to UV radiation over many years. In 2016, the European Academy of Dermatology and Venereology called for the recognition of NMSC as an occupational disease. NMSC incidence is increasing, with 2–3 million people diagnosed worldwide annually, and average yearly increases of 3–8 per cent among Caucasian populations in Australia, Europe, the United States and Canada over the past 30 years. It is estimated that outdoor workers are exposed to 2–3 times more UV radiation than indoor workers, and that working outdoors for more than 5 years triples the risk for BCC, SCC and actinic keratosis. While the number of Australians diagnosed with skin cancer is high, mortality associated with it is low. This could be due to long-running public education campaigns and widespread provision of treatment options (Australian Institute of Health and Welfare, 2016). In 2014, 2067 people died from skin cancer in Australia, 1467 from melanoma and 600 from NMSC. The five-year survival rate for people diagnosed with melanoma is 90 per cent. The UV index and sun protection factor (SPF) are useful indicators of the need for protection from the sun and the extent of protection offered by sunscreen, clothing and shelter. The UV index describes the daily danger of solar UV radiation intensity. Each point on the UV index, from 0 (low) to 11+ (extreme) is equivalent to 25 milliWatts per square metre of UV radiation. A UV index of 0–2 means sun protection is generally unnecessary unless exposed for long periods. Most Australians need sun protection when the UV index is 3 (moderate) or higher. To reduce UV exposure, cover your skin with clothing, sunglasses and a hat when outdoors, and keep in the shade if possible. Use a water-resistant sunscreen with a high SPF that blocks both UVA and UVB rays, and reapply every two hours. The SPF is a measure of protection against UV radiation. It is the ratio of the UV radiation dose someone would receive without sunscreen to that received with a carefully applied sunscreen. Therefore, if an SPF30 sunscreen is applied properly to skin, it will receive a UV radiation dose 30 times smaller than skin without any sunscreen. Sunscreen or clothing rated at SPF30 filters 96.7 per cent and SPF50 filters 98 per cent of UVB. SPF4 means only 75 per cent of UV radiation is blocked. The term ‘broad spectrum’ means that sunscreen protects against UVA rays as well as UVB. Research conducted in Nambour, in south-eastern Queensland, in the early 1990s showed the daily use of SPF15+ sunscreen on the head, neck, arms and hands reduced the risk of SCC by 12 per cent and the risk of melanoma by about half. Interestingly, the researchers found sunscreen had no effect on the incidence of BCC. A tan offers minimal protection from sunburn, usually equivalent to SPF3, depending on your skin type. It does not protect from DNA damage, which can lead to skin cancer. Almost half of Australian adults believe that a tan looks healthy, but a tan is not a sign of good health. Tanning is skin damage resulting from exposure to UV radiation. It will eventually cause loss of elasticity (wrinkles), sagging, yellowish discolouration and even brown patches on skin, and increases the risk of skin cancer. Skin cancer can be removed with surgery, cryotherapy (using liquid nitrogen to rapidly freeze and destroy the cancer), curettage (scraping), cautery (burning), chemotherapy or radiotherapy. Treatment for melanoma depends on its stage. Stage 0 means the melanoma is less than 0.1 mm thick, stage I 0.1–2 mm, stage II greater than 2 mm, stage III means it has spread to lymph nodes and stage IV means distant spread. Surgery can resolve thin melanomas and requires removal of the melanoma and 1–2 cm of normal skin around it. If the melanoma has spread to the lymph nodes, lymph node dissection or lymphadenectomy is required. Non-melanoma skin cancer can often be treated with chemotherapy (ointment or cream). Radiotherapy can be used if cancers are in areas that are difficult to treat with surgery, such as near the eyes or on the nose or forehead. Australian Institute of Health and Welfare (2016). Skin cancer in Australia. Cat. no. CAN 96. Canberra: AIHW. Dr Campbell Aitken is a freelance editor and a senior research fellow at the Burnet Institute. If you would like to write an article for our Talking Points newsletter or In Brief blog, email Cassandra Hamilton (cassandrahamilton&commat;westernalliance.org.au) or call 03 4215 2900.